You are a gust of wind, carrying snatched flower petals and returning beauty to the landscape. That delightfully precious sentence is a completely accurate summary of Flower, Thatgamecompany's breakout 2009 title for the Playstation platform. 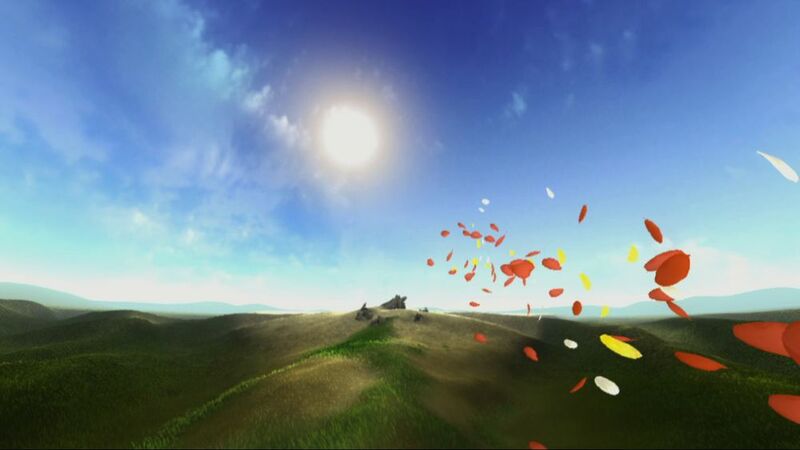 That studio went on to make the even-more-acclaimed Journey but I feel that Flower is actually the better introduction to Thatgamecompany director Jenova Chen's evocative game designs. Flower's polished motion controls and simple gameplay demands never fail to create moments of serious joy for players, especially that first time they get to play. This will always be my go-to title for demonstrating the unique possibilities and untapped strengths of the video game format. Absolutely, drop-dead gorgeous. Everything has a nice, warm and soft glow to it and the lack of any pressing dangers mean that this is a totally safe and beautiful place to play. The game's mechanics have your gust of wind running over series of flowers in order to bring back the environment, and while this is a well-trod trope, there is still a good sense of satisfaction in restoring the world around you. Additionally, the simple act of picking up the controller and flying and dashing along the landscape is sensational. Accessible, focused, polished. Just about perfect. Find a way to play this!! The biggest stumbling block for Flower is undoubtedly its limited platform, though it does make excellent use of the platform's motion capabilities on both home console and portable Vita version. Besides that, I can see people complaining about its length. I prefer to savor one, brief but beautiful level at a time, but I can understand that you might be wanting more if you blast right through it. Also, I suppose there's not a lot of depth in mechanics but for me I still replay it often for the beautiful feeling of that one basic mechanic.